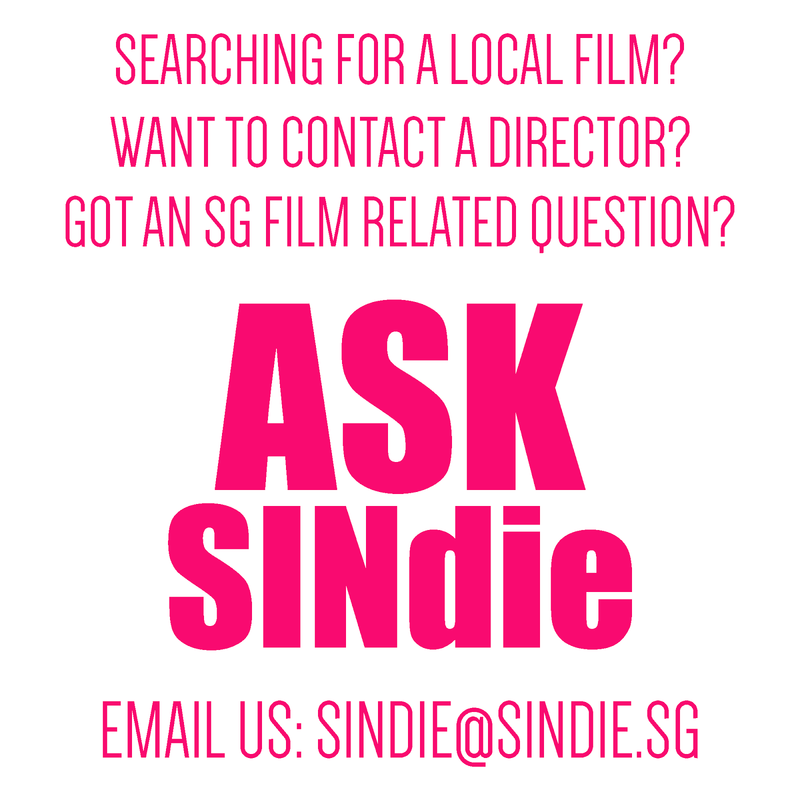 SINdie was lucky enough to be able to catch up with directors Tan Bee Thiam and Yuan Bin on the process of making the film, and thoughts on responses from audience members and future distribution plans. Twenty years ago, Habiba and Eric were neighbours. When Eric revisits her home to find her still living there with her husband, what seems like a friendly reunion turns into the gradual revelation of a painful secret from the past. 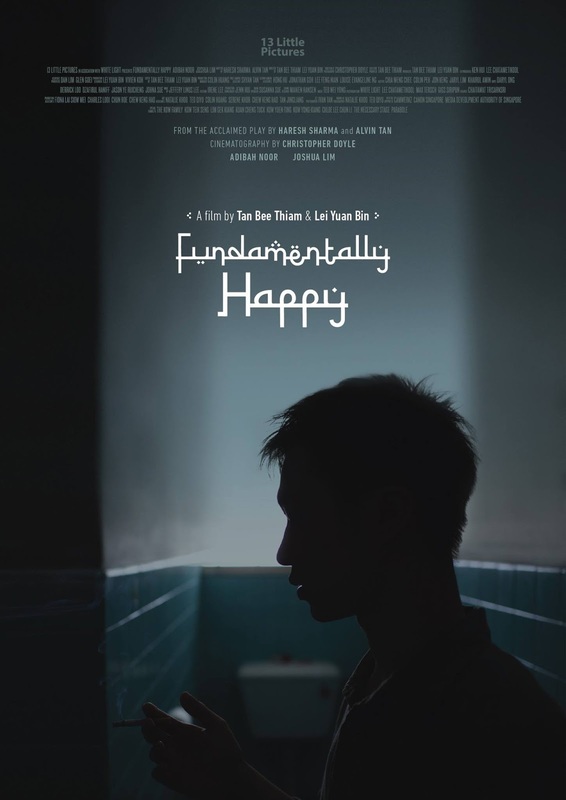 From the acclaimed play by Haresh Sharma and Alvin Tan, Fundamentally Happy was the Winner of Best Production and Best Original Script at the 2007 Life! Theatre Awards. 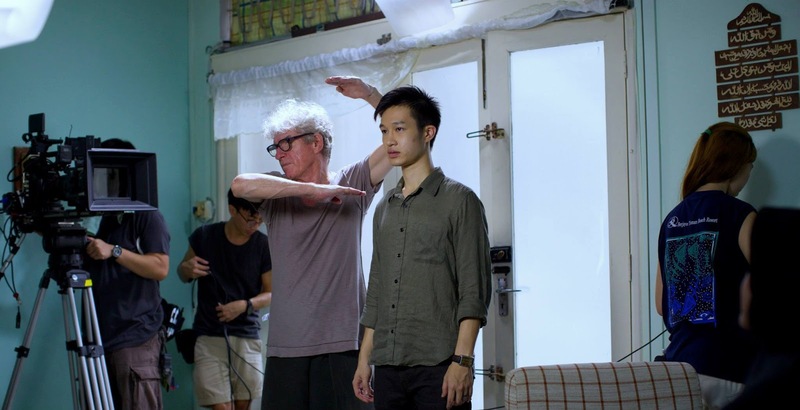 This chamber drama gets a film treatment by Singapore independents Tan Bee Thiam and Lei Yuan Bin, with the camera helmed by Christopher Doyle. With its wrenching psychodrama and scalpel-edged dialogue, the films moody cinematography and varied close-ups bring viewers further into the storys heart of darkness, breaking down the distance of the stage and cinemas fourth wall, and creating its own form of detachment. An unflinching look at the consequences of abuse, Fundamentally Happy explores without judgment or condemnation critical issues such as trust, memory, relationships and consent. 1. How did the directorial collaboration between yourself and Yuan Bin come about? We were always curious how two directors can collaborate on the same film and so we gave it a try with this project. 13 Little Pictures has always been about creative collaboration so it was a natural decision. 2. How did you two work together in the process of making this film? Both of us are collaborative in nature. We work in an organic way. We have a lot of creative conversations in every stage of the production. We challenge and inspire each other. When we differ in opinion, we let each other have a take each or a separate edit (for a scene for example). Our best decisions are always the consensual ones. On set, as time was the essence, I would often be the one conveying our decisions to the cast while Yuan Bin would do so to the crew. For more than a year, we edited together in the evenings and over weekends. Christopher Doyle and lead actor Joshua Jonathan Lim. 3. What were some reasons you and Yuan Bin chose to adapt Fundamentally Happy from stage to film? We are great admirers of the work of Haresh, Alvin and The Necessary Stage. We are very inspired by the Singapore stories produced by our writers and theatre-makers. When we read Fundamentally Happy, we were immediately attracted by how cinematic it was. It reminded us of the chamber films of Bergman, who also straddled between theatre and film. Therefore, we thought it would be a great work for us to explore the intersection of two mediums. We have not seen another work that addresses the important issue of abuse so eloquently and compassionately. By adapting it, we hope to multiply the impact of this work so it reaches out to more people. 4. Were you inspired by other meta-theatrical or chamber films (perhaps such as Dogville (2003) and those of Ingmar Bergman)? If so, could you tell us which ones and how so? As mentioned in our directors' statement, we are inspired by the chamber films of Ingmar Bergman, particularly Though a Glass Darkly, Winter Light and The Silence. 5. How did you work with the cast (Adibah Noor and Joshua Lim) to for e.g. To get them to immerse in past memory & recollection, while coming to terms with unraveled truths in present space and time? We cast Adibah ( from Malaysia) playing Habiba and Joshua (from Singapore) playing Eric. Both of them did not meet each other until a day before the shoot. We shot in sequence to allow them to acquaint with the emotional arc of the narrative. We did not want actors who are similar to the characters. Unlike Habiba, Adibah is not married and does not have kids. Joshua does not have the traumatic childhood of Eric but did have a Malay neighbour growing up. We did not want the actors to tap on their memories and experiences. We did not want the actors to get too personal or close to the work. We did not want the actors to get too close to each other. After shoot, we would send them back as soon as we could. We did not want them to discuss or interpret. We did not want them to be overly emotional or affected. Instead, we require them to place complete faith in the characters that Haresh and Alvin have created and to let the words guide them. Laugh when you are amused. Cry when you really feel you would. Hold it back too and not feel the need to always have to show how you feel. Like in real life. We asked them to trust their instincts. Once we got what we need, we also give our actors the freedom to ask for a take if they feel the impulse to try again or to try something different from our direction. 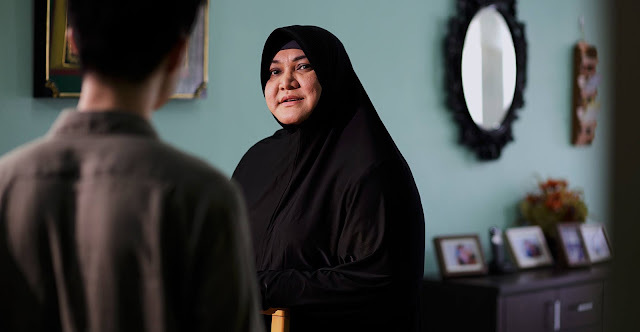 Close-up on lead actress Adibah Noor. 6. Could you share some memorable anecdotes (incidents, challenges etc) faced during the production of this film? We were still painting the house the day before shoot. We shot over Christmas and New Day and were dressing up the set ourselves, along with many kind production and art assistants. Thankfully the paint dried in time. In the film, there was a scene where Eric had to slap Adibah, who’s a respected veteran personality in Malaysia. Adibah was very professional and requested Joshua (Eric) to really slap her. Being the gentlemen that he is, Joshua was really conflicted and could not bear to do so. 7. What were some initial reactions from viewers, e.g ‘test audiences’? Most audience members complimented ​on ​the strong performances by Joshua and Adibah. We are really happy their hard work paid off. There were also questions about how the film is different from the play, what was left out and what was added. We are not too interested about fidelity as the process and approach are more important for us. Instead, we like to think that the film is the result of us thinking of connections and having conversations between the source and the adapted text. Through months of discussing the work with Haresh, months of looking for our actors and more than a year editing the film, what we presented is what we understand about Fundamentally Happy and what we think is true to its spirit. 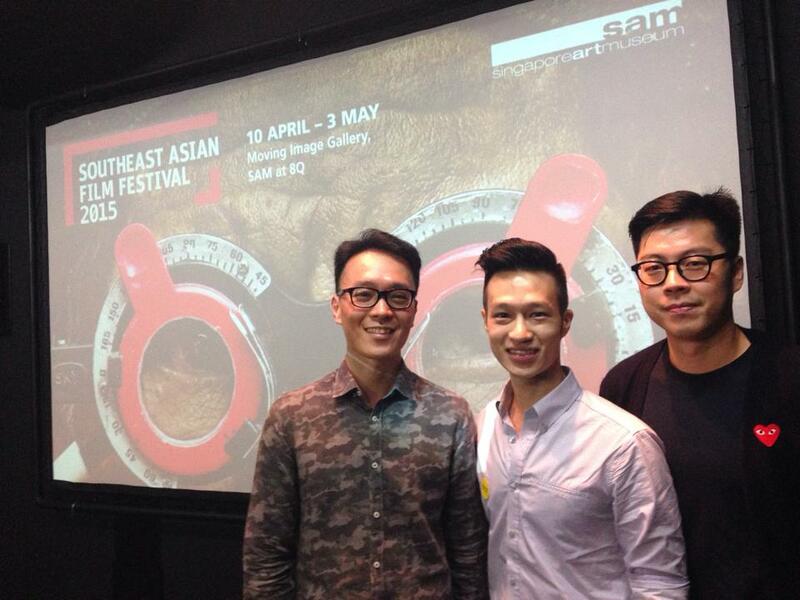 Lead actor Joshua Jonathan Lim with director Tan Bee Thiam. 8. What are your distribution plans for this film? Any specific plans for film distribution regionally and internationally? We plan to let the film travel the film festival circuit first and then have a limited release in Singapore and Malaysia, if there is interest from distributors. Hopefully there will be a brave distributor who will pick up the film as it is about something important we should be talking about. 9. 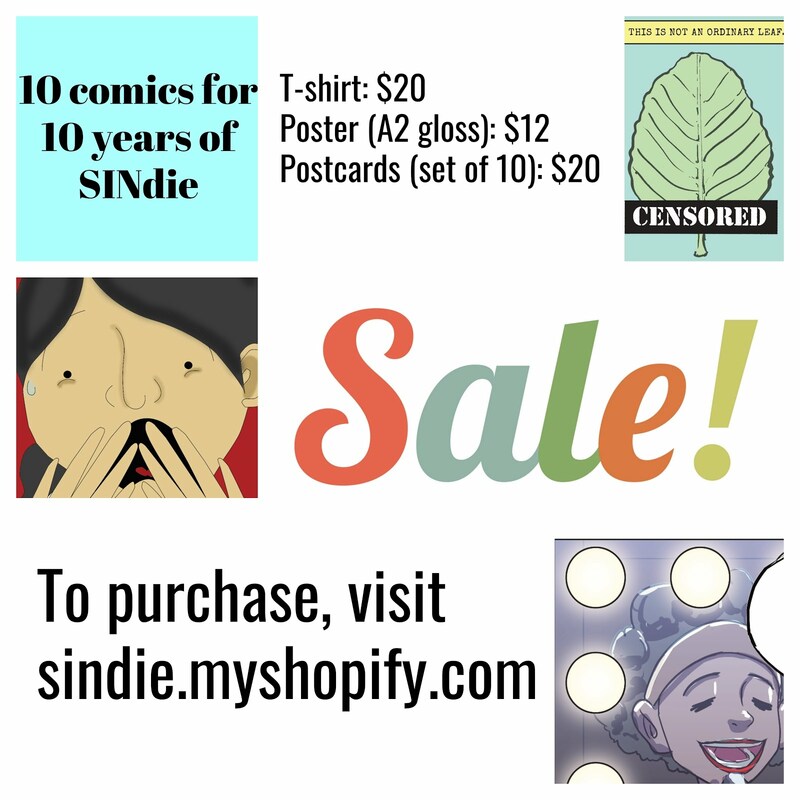 Any future collaborative plans between yourself and Yuan Bin in the pipeline? If no, what are you going to be working on next? Both of us will be collaborating again in our own new feature projects. I will be directing another film and Yuan Bin will be co-producing it. Yuan Bin is writing a new feature script and I am producing for him. 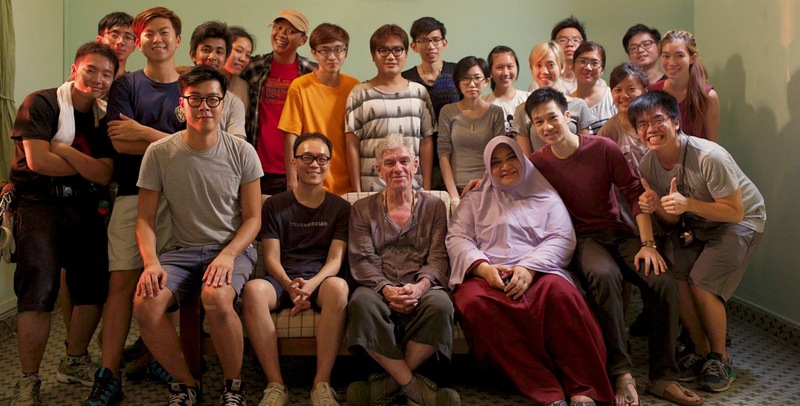 Cast and crew (Christopher Doyle included) of Fundamentally Happy. Directors of Fundamentally Happy Tan Bee Thiam, Lei Yuan Bin and actor Joshua Lim (middle) at the Southeast Asian Film Festival screening.